Thanks to Sheela Sinharoy, MPH PhD, Emory University for kindly sharing her experience from one of our ‘Meet the Expert’ events at the International Congress of Nutrition 2017 in the following article. 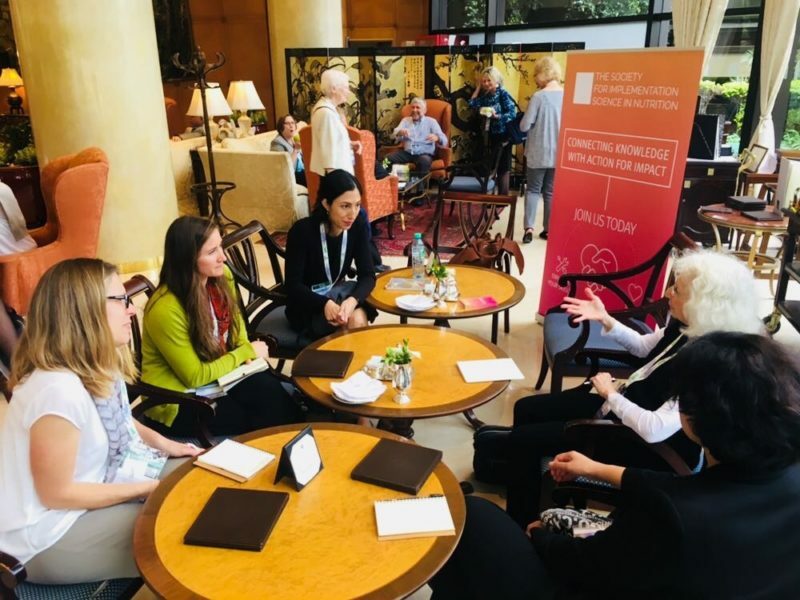 At the International Congress of Nutrition 2017 in Buenos Aires in October, SISN offered the opportunity to meet in small groups with several members of its leadership. One of these meetings was with Dr. Gretel Pelto, Graduate Professor, Division of Nutritional Sciences, Cornell University. Over tea and cookies, four early career researchers discussed mixed methods research in implementation science with Dr. Pelto. First, Dr. Pelto posed a question: what is the difference between a formative evaluation and a process evaluation? Some participants suggested that “formative evaluation” refers to exploratory research that is done prior to designing a trial, while “process evaluation” is done to assess problems after the trial is underway. From another perspective, formative evaluation is done after a program has been implemented to identify problems and make mid-course corrections, whereas “process evaluation” relates more to monitoring. Given these different viewpoints, the participants agreed that SISN could help develop definitions and vocabulary, which would facilitate communication among IS researchers and practitioners. The conversation then moved on to how mixed methods fit in implementation science in nutrition, and what methodological issues researchers are confronting in their mixed method studies. One methodological point related to the use of focus group discussions (FGDs). Dr. Pelto pointed out that the “n” for a focus group (the number of respondents in any specific group) is “1” because what people say in a group setting is a reflection of social norms, not necessarily a statement about their individual behaviors or beliefs. Dr. Pelto referred to the work of the sociologist Erving Goffman, who wrote about the public “performance” (of group interviews) vs the private nature of individual interviews. Another discussion point was about the types of data that researchers should collect to meet different purposes, especially to better understand the “black box” of implementation and to influence policy. What kinds of data will give us the most insight into why interventions do or do not work, and what kinds of data will be most user-friendly and persuasive for policymakers? The discussion was interesting and thought-provoking, in addition to being a great opportunity to meet an icon of nutrition research and to network with other early career researchers. We hope that these “discussion cafés” will become a regular activity for SISN members at future conferences and meetings.